Grammy award-winning violinist, Miri Ben-Ari collaborated with Theophilus London on three new tracks from his album, VIBES, executive produced by Kanye West. London’s already raved about sophomore effort is available today, November 4th, on Warner Brothers. Ben-Ari, a classically-trained violinist known for her revolutionary fusion of classical soul and dance music, has worked with artists such as Kanye West, Jay Z, Alicia Keys, Wynton Marsalis, Donna Summer and Armin Van Buuren. Originally from Israel, Ben-Ari is a featured blogger for the Huffington Post and the CEO of the nonprofit Gedenk, which promotes tolerance to safeguard a peaceful society based on lessons learned from the Holocaust and other genocides. Ben-Ari has been the face of many promotional campaigns, including Reebok’s “I Am What I Am” global print and TV advertisements, Vodafone, Pepsi, Coca-Cola and now Harman Kardon. She was honored as an “Apollo Legend” by the Apollo theater in New York City, “International Jewish Woman To Watch of 2007 Award,” “2008 Israel Film Festival Visionary Award,” the American Society for Yad Vashem Award, “Young & Powerful for Obama” 2011 Rising Star Award, the “Martin Luther King Award” from Israeli President Shimon Peres and the “2012 Big Vision Awards.” In 2011, Ben-Ari was invited by First Lady Michelle Obama to the White House for a special performance and to be honored as a “Remarkable Woman” and in 2012, Ben-Ari was invited to perform for President Barack Obama. Ben-Ari spent much of 2014 in the studio creating a new sound for her comeback album in 2015. She is currently the Global Brand Ambassador for Harman Kardon and was recently named Goodwill Ambassador of Music for the United Nations Association of Brasil. Ben-Ari was featured on the title track of Armin Van Buuren’s (#1 DJ in the world) latest album, Intense, which was chosen as the “Tune of the Year” in 2013 by the ASOT community in Electronic Dance Music. 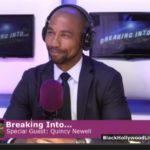 Next Post Black Hollywood Live's episode of "Breaking Into...Film Distribution with Quincy Newell"